Antec introduced the High Current Gamer Series, a new line of power supplies for gamers who desire the perfect balance between performance, high reliability and an affordable price. The High Current Gamer Series lineup is available in 400W, 520W, 620W, 750W and 900W editions for $74.95, $89.95, $109.95, $149.95 and $169.95, respectively. 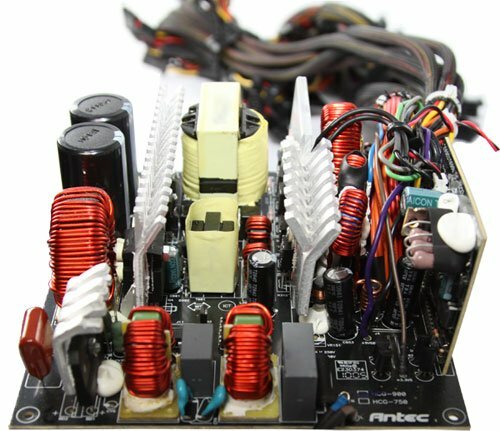 Antec, Inc., the global leader in high-performance computer components and accessories for the gaming, PC upgrade and Do-It-Yourself markets, today announced the first complete series of power supply units (PSUs) to offer consumers the high current capability favored by gamers and other high-power users, along with the safety of over current protection on all power rails. The High Current Gamer series is designed to optimize high-output current delivery while reducing wiring loss, resulting in unsurpassable value and reliability in a package that provides affordability and accessibility to gamers and power users working within varying budgets. Every model in the High Current Gamer series features over current protected +12V rails with High Current functionality, allowing them to deliver high power while minimizing power loss to wiring resistance. All High Current Gamer power supplies achieve the 80 PLUS® Bronze certification level, delivering their rated Continuous Power with a minimum of 82% efficiency at typical loads. Active Power Factor Correction (Active PFC) on all models, with a power factor above 0.9 helps to reduce electrical waste and further increases efficiency. The series features two top-end models: the HCG-750 and HCG-900, each delivering 750 and 900-watts of Continuous Power, respectively. The series is rounded out with three additional models: HCG-620, HCG-520 and HCG-400, each outputting its own rated 620, 520 and 400-watts of Continuous Power. "Gamers and high-performance users looking for a top-notch solution to power demanding builds should look to Antec's High Current Gamer series," said Scott Richards, senior vice president of Antec. "As the first consumer power supply line to offer a fully protected 40 amperes of maximum current on its +12V rails, the HCG gives users outstanding power capabilities needed to support the most current high-end graphics cards, extensive drive arrays and multi-core CPUs. The HCG is a striking example of Antec's ongoing dedication to producing innovative, reliable products that meet the latest needs of gamers and creative users." The High Current Gamer series supports Intel multi-core, Core i3, Core i7 and Core i5 CPUs, as well as AMD Phemon II X6 CPUs and quad GPUs. In addition, the HCG-750 and HCG-900 are NVIDIA® SLI®-Ready and ATI CrossFireX™ certified. Additional features on the High Current Gamer include reliable Japanese brand capacitors as well as a 135 mm double-ball bearing fan, providing the performance, reliability and high stability required for cutting-edge gaming and professional systems. The entire High Current Gamer series is now available through major retailers, e-tailers and distributors. The HCG-400, HCG-520 and HCG-620 models are backed by Antec's AQ3 Antec Quality 3-Year limited warranty on parts and labor, and the HCG-750 and HCG-900 are backed by Antec's AQ5 Antec Quality 5-Year limited warranty on parts and labor.